Though today technology is just about everywhere, it doesn’t take much to get a business started. You could even make do with a laptop, a free Wi-Fi connection, and a Facebook page. However assuming you want your startup to have at least a small main office and a basic professional setup, these are the basics you will need. As far as computers go, you need something that can handle the programs you plan to be using or the types of files you expect to be looking over (if you outsource most coding and design work.) These specs are increasing every day so it may be best to pick something closer to the higher range of what you can afford and put off upgrading as long as you can. With the average lifespan of a desktop PC being about five years, you shouldn’t need to invest in anything too fancy. Even a mobile app developer can get by on something with mid-range specs for this long, as long as they’re not heavily invested in 3D graphics or running many memory-intensive programs at the same time. Today, you want an internet connection somewhere in the range of 50 to 100 Mbps if you’re connecting as many as five devices. This will allow each machine to download and upload just about anything at a reasonable rate. Another thing to keep in mind is the latency or ping rate. Latency will create issues for things like video calls, chat, live streams, and more. Ideally, you want a connection with 150 milliseconds for your ping rate. The smaller that number is, the better. Any startup, today, should have a website. Not only can it be a hub for fans and customers, but it’s also a great form of advertising and one of the best ways to focus on an inbound marketing campaign. To begin, you may start with shared hosting. It won’t allow for a lot of space or a lot of traffic, but you may not have that at first. However, soon you will want to move up to VPS hosting, giving you more space and security. You’ll also need a domain with an SSL certificate, especially if you plan to use e-commerce, payments, data collection, or shopping cart feature on your website. All of these costs are variable and depend on your exact needs. It should be noted that many reliable hosts these days do offer free SSL certificates and setup, or at least a limited number of them. Once you own your domain and set up your website, it’s also essential to make use of analytics to manage your marketing efforts. The type you choose to use may vary depending on your website’s setup and your industry. To begin, you need a way to keep track of your income and expenses right away. Even if you’re a startup, you’re not in business if you’re not making money or don’t plan to do so soon. 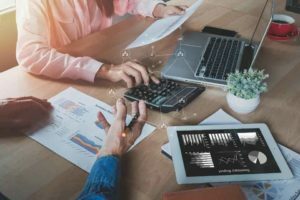 No matter what your goals are, digitizing these accounting and bookkeeping efforts can help you save time and keep your startup on the right track.